The Foreign Office said it had "secured the best possible deal". The apartment "will help promote the UK in the commercial capital of our largest export market for years to come", it said. Two of the five bedrooms in the apartment are currently designated "staff bedrooms" on the floor plan, but the UK Foreign Office said only the consul general and his immediate family will live there. Designed by British architect Norman Foster, the 44-storey building is close to the UN headquarters in Manhattan and is described as the "ultimate global address". On the website of architects Foster and Partners, the high-rise is described as a "luxury residential tower occupying a prestigious location". 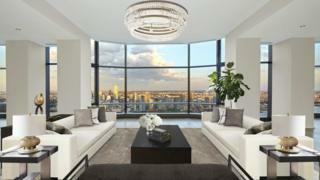 Every apartment features floor to ceiling bay windows and "generous space for entertaining", the firm says. "Adding a touch of elegance to every detail, the powder room walls are fitted with glazed silk panels in a choice of either bold primary or natural colours," it adds. The penthouse was bought by "Her Britannic Majesty's Secretary of State for Foreign and Commonwealth Affairs" on 15 March, according to New York City records. In a statement, the Foreign Office, said that the residence "will also be used to support his work to help British businesses as Her Majesty's trade commissioner for North America." It said it was in the process of selling the consul general's current residence. "At least someone is going to do OK out of Brexit," Labour MP Gareth Thomas tweeted, in response to the purchase. Stewart Maxwell, a special adviser to Scotland's first minister Nicola Sturgeon on business and the economy, tweeted: "UK Tory government make clear that austerity isn't for everybody". Chloe Westley, from the TaxPayers' Alliance, which lobbies for lower taxes and greater government efficiency, said: "What's often forgotten is that these luxuries come at the expense of hard pressed families, who want the money that they give to the government to go primarily towards public services." She added that taxpayers would hope diplomats "earn their keep by creating opportunities for British businesses and consumers". In 2015, the New Zealand government was criticised over reports it spent $8m (£6.05m) on a "lavish" 18th-floor apartment in the 50 United Nations Plaza for the country's UN ambassador Gerard van Bohemen to live in.